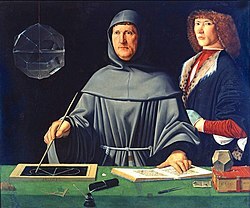 巴黎大学的尼克尔·奥里斯姆和意大利的Giovanni di Casali独立的提出了（这个关系）的图示，断定一条表示均匀加速运动的直线，直线下面积就是物体运动的总路程。在随后对欧几里得《几何原本》的注解中，奥里斯姆demonstrated that a body will acquire in each successive increment of time an increment of any quality that increases as the odd numbers. 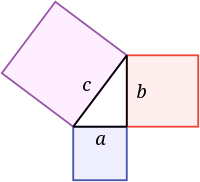 Since Euclid had demonstrated the sum of the odd numbers are the square numbers, the total quality acquired by the body increases as the square of the time[如何翻譯]. ^ Neugebauer, Otto. The Exact Sciences in Antiquity 2. Dover Publications. 1969 . ISBN 978-0-486-22332-2. Chap. IV "Egyptian Mathematics and Astronomy", pp. 71–96. ^ Heath. A Manual of Greek Mathematics. : 5. ^ Sir Thomas L. Heath, A Manual of Greek Mathematics, Dover, 1963, p. 1: "In the case of mathematics, it is the Greek contribution which it is most essential to know, for it was the Greeks who first made mathematics a science." 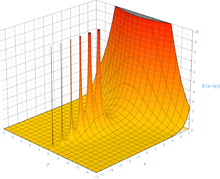 ^ Williams, Scott W. The Oldest Mathematical Object is in Swaziland. Mathematicians of the African Diaspora. SUNY Buffalo mathematics department. 2005 [2006-05-06]. ^ Thom, Alexander, and Archie Thom, 1988, "The metrology and geometry of Megalithic Man", pp 132-151 in C.L.N. Ruggles, ed., Records in Stone: Papers in memory of Alexander Thom. Cambridge University Press. ISBN 0-521-33381-4. ^ Aaboe, Asger. Episodes from the Early History of Mathematics. New York: Random House. 1998: 30–31. ^ Martin Bernal, "Animadversions on the Origins of Western Science", pp. 72–83 in Michael H. Shank, ed., The Scientific Enterprise in Antiquity and the Middle Ages, (Chicago: University of Chicago Press) 2000, p. 75. ^ Eves, Howard, An Introduction to the History of Mathematics, Saunders, 1990, ISBN 0-03-029558-0. ^ Kurt Von Fritz. The Discovery of Incommensurability by Hippasus of Metapontum. The Annals of Mathematics. 1945. ^ James R. Choike. The Pentagram and the Discovery of an Irrational Number. The Two-Year College Mathematics Journal. 1980. ^ Calian, George F. One, Two, Three… A Discussion on the Generation of Numbers (PDF). New Europe College. 2014. （原始内容 (PDF)存档于2015-10-15）. ^ Howard Eves, An Introduction to the History of Mathematics, Saunders, 1990, ISBN 0-03-029558-0 p. 141: "No work, except The Bible, has been more widely used...."
^ Needham, Joseph. Science and Civilisation in China. 3, Mathematics and the Sciences of the Heavens and the Earth. Taipei: Caves Books Ltd. 1986. ^ T. K. Puttaswamy, "The Accomplishments of Ancient Indian Mathematicians", pp. 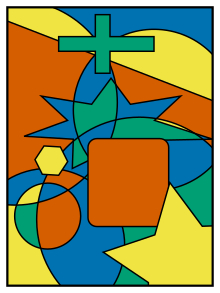 411–2, in Selin, Helaine; D'Ambrosio, Ubiratan (编). Mathematics Across Cultures: The History of Non-western Mathematics. Springer. 2000. ISBN 1-4020-0260-2. ^ J.J. Connor, E.F. Robertson. The Indian Sulba Sutras Univ. of St. Andrew, Scotland  The values for π are 4 x (13/15)2 (3.0044...), 25/8 (3.125), 900/289 (3.11418685...), 1156/361 (3.202216...), and 339/108 (3.1389). ^ Bronkhorst, Johannes. Panini and Euclid: Reflections on Indian Geometry. Journal of Indian Philosophy (Springer Netherlands). 2001, 29 (1–2): 43–80. doi:10.1023/A:1017506118885. ^ Sanchez, Julio; Canton, Maria P. Microcontroller programming : the microchip PIC. Boca Raton, Florida: CRC Press. 2007: 37. ISBN 0-8493-7189-9. ^ Hall, Rachel W. Math for poets and drummers (PDF). Math Horizons. 2008, 15: 10–11. ^ Boyer. The Arabic Hegemony. History of Mathematics. 1991: 226. By 766 we learn that an astronomical-mathematical work, known to the Arabs as the Sindhind, was brought to Baghdad from India. It is generally thought that this was the Brahmasphuta Siddhanta, although it may have been the Surya Siddhanata. A few years later, perhaps about 775, this Siddhanata was translated into Arabic, and it was not long afterwards (ca. 780) that Ptolemy's astrological Tetrabiblos was translated into Arabic from the Greek. ^ P. P. Divakaran, The first textbook of calculus: Yukti-bhāṣā, Journal of Indian Philosophy 35, 2007, pp 417 - 433. ^ Pingree, David, Hellenophilia versus the History of Science, Isis, December 1992, 83 (4): 562, JSTOR 234257, doi:10.1086/356288, One example I can give you relates to the Indian Mādhava's demonstration, in about 1400 A.D., of the infinite power series of trigonometrical functions using geometrical and algebraic arguments. When this was first described in English by Charles Whish, in the 1830s, it was heralded as the Indians' discovery of the calculus. This claim and Mādhava's achievements were ignored by Western historians, presumably at first because they could not admit that an Indian discovered the calculus, but later because no one read anymore the Transactions of the Royal Asiatic Society, in which Whish's article was published. The matter resurfaced in the 1950s, and now we have the Sanskrit texts properly edited, and we understand the clever way that Mādhava derived the series without the calculus; but many historians still find it impossible to conceive of the problem and its solution in terms of anything other than the calculus and proclaim that the calculus is what Mādhava found. In this case the elegance and brilliance of Mādhava's mathematics are being distorted as they are buried under the current mathematical solution to a problem to which he discovered an alternate and powerful solution. ^ （Boyer 1991，"The Arabic Hegemony" p. 230） "The six cases of equations given above exhaust all possibilities for linear and quadratic equations having positive root. So systematic and exhaustive was al-Khwārizmī's exposition that his readers must have had little difficulty in mastering the solutions." ^ Gandz and Saloman (1936), The sources of Khwarizmi's algebra, Osiris i, pp. 263–77: "In a sense, Khwarizmi is more entitled to be called "the father of algebra" than Diophantus because Khwarizmi is the first to teach algebra in an elementary form and for its own sake, Diophantus is primarily concerned with the theory of numbers". ^ （Boyer 1991，"The Arabic Hegemony" p. 229） "It is not certain just what the terms al-jabr and muqabalah mean, but the usual interpretation is similar to that implied in the translation above. The word al-jabr presumably meant something like "restoration" or "completion" and seems to refer to the transposition of subtracted terms to the other side of an equation; the word muqabalah is said to refer to "reduction" or "balancing" - that is, the cancellation of like terms on opposite sides of the equation." ^ Rashed, R.; Armstrong, Angela. 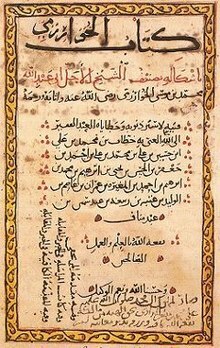 The Development of Arabic Mathematics. Springer. 1994: 11–12. ISBN 0-7923-2565-6. OCLC 29181926. ^ Sesiano, Jacques. Abū Kāmil. 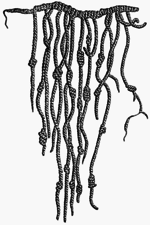 Encyclopaedia of the history of science, technology, and medicine in non-western cultures. Springer: 4–5. 1997-07-31. ^ Victor J. Katz (1998). History of Mathematics: An Introduction, pp. 255–59. Addison-Wesley. ISBN 0-321-01618-1. ^ F. Woepcke (1853). Extrait du Fakhri, traité d'Algèbre par Abou Bekr Mohammed Ben Alhacan Alkarkhi. Paris. ^ Katz, Victor J. Ideas of Calculus in Islam and India. Mathematics Magazine. 1995, 68 (3): 163–74. doi:10.2307/2691411. ^ Caldwell, John (1981) "The De Institutione Arithmetica and the De Institutione Musica", pp. 135–54 in Margaret Gibson, ed., Boethius: His Life, Thought, and Influence, (Oxford: Basil Blackwell). ^ Folkerts, Menso, "Boethius" Geometrie II, (Wiesbaden: Franz Steiner Verlag, 1970). ^ Marie-Thérèse d'Alverny, "Translations and Translators", pp. 421–62 in Robert L. Benson and Giles Constable, Renaissance and Renewal in the Twelfth Century, (Cambridge: Harvard University Press, 1982). ^ Guy Beaujouan, "The Transformation of the Quadrivium", pp. 463–87 in Robert L. Benson and Giles Constable, Renaissance and Renewal in the Twelfth Century, (Cambridge: Harvard University Press, 1982). ^ Grant, Edward and John E. Murdoch (1987), eds., Mathematics and Its Applications to Science and Natural Philosophy in the Middle Ages, (Cambridge: Cambridge University Press) ISBN 0-521-32260-X. ^ Clagett, Marshall (1961) The Science of Mechanics in the Middle Ages, (Madison: University of Wisconsin Press), pp. 421–40. ^ Murdoch, John E. (1969) "Mathesis in Philosophiam Scholasticam Introducta: The Rise and Development of the Application of Mathematics in Fourteenth Century Philosophy and Theology", in Arts libéraux et philosophie au Moyen Âge (Montréal: Institut d'Études Médiévales), at pp. 224–27. ^ Clagett, Marshall (1961) The Science of Mechanics in the Middle Ages, (Madison: University of Wisconsin Press), pp. 210, 214–15, 236. ^ Clagett, Marshall (1961) 中世纪数学科学 (Madison:Wisconsin 大学出版社), p. 284. ^ Clagett, Marshall (1961) 中世纪数学科学, (Madison: University of Wisconsin Press), pp. 332–45, 382–91. ^ Nicole Oresme, "Questions on the Geometry of Euclid" Q. 14, pp. 560–65, in Marshall Clagett, ed., Nicole Oresme and the Medieval Geometry of Qualities and Motions, (Madison: University of Wisconsin Press, 1968). ^ della Francesca, Piero. De Prospectiva Pingendi, ed. G. Nicco Fasola, 2 vols., Florence (1942). ^ della Francesca, Piero. Trattato d'Abaco, ed. G. Arrighi, Pisa (1970). ^ della Francesca, Piero. L'opera "De corporibus regularibus" di Pietro Franceschi detto della Francesca usurpata da Fra Luca Pacioli, ed. G. Mancini, Rome, (1916). ^ Grattan-Guinness, Ivor. The Rainbow of Mathematics: A History of the Mathematical Sciences. W.W. Norton. 1997. ISBN 0-393-32030-8. ^ Kline, Morris. Mathematics in Western Culture. Great Britain: Pelican. 1953: 150–151. ^ Struik, Dirk. A Concise History of Mathematics 3rd. Courier Dover Publications. 1987: 89. ISBN 9780486602554. ^ Eves, Howard, An Introduction to the History of Mathematics, Saunders, 1990, ISBN 0-03-029558-0, p. 379, "...the concepts of calculus...(are) so far reaching and have exercised such an impact on the modern world that it is perhaps correct to say that without some knowledge of them a person today can scarcely claim to be well educated." ^ Maurice Mashaal, 2006. Bourbaki: A Secret Society of Mathematicians. American Mathematical Society. ISBN 0-8218-3967-5, ISBN 978-0-8218-3967-6. ^ Alexandrov, Pavel S., In Memory of Emmy Noether, (编) Brewer, James W; Smith, Martha K, Emmy Noether: A Tribute to Her Life and Work, New York: Marcel Dekker: 99–111, 1981, ISBN 0-8247-1550-0 . ^ Maths genius declines top prize. BBC News. 22 August 2006 [16 June 2011].